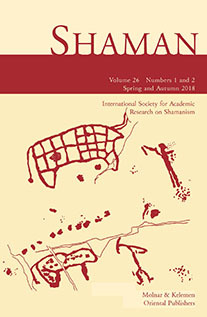 Strathern, Andrew & Stewart, Pamela J.
Shamanic healing practices often occupy an ambiguous or liminal status in the political or medical systems that have incorporated biomedical practices and ideologies.Â Yet shamans can also be very significant in circumstances of the revival of cultural heritage. Even if they are discouraged at a state level, they carry enduring popularity and significance at the popular level. Drawing on case materials from the Pacific and South-East Asia, we first explore the tension between centrality and peripherality in the symbolic and material emplacement of the shamanâ€™s calling. We then compare these case materials with those as ancient Greek divination, prophesy, and healing practices, suggesting a broad field of comparative issues that are entailed in such a comparison. A cosmological map sketched by a Semelai shaman brings together distinct narratives of sickness and death, while establishing the shamanâ€™s authority as a healer and cosmologist. This paper relates the map to Semelai cultural models of living, healing, and dying. Semelais speak an Austro-Asiatic language and are a traditionally swidden agricultural and trade-oriented Orang Asli group in the southern lowlands of Peninsular Malaysia. Because Semelai shamans have been soul-journeying, they are seen as powerful healers who are also potentially harmful to their enemies. Analysis of the b-blyan, an all-night topogenic, shamanic ritual in which the shaman searches for the patientâ€™s soul, suggests that the ritual restricts the shamanâ€™s soul while lending him exceptional spiritual and healing powers. The b-blyan is one narrative indexed in the map; others include two Semelai magical incantations, their mortuary practices, categories of death, and finally, the question of divine reward and retribution. In the map, the shaman, Kak, attempts to reconcile these disjunctive theories in order to bring them within his worldly and celestial powers. The Aboriginal concept of health is holistic, encompassing the mental, physical, cultural and spiritual aspects of the individual. The strength of the traditional belief and value system of the Ngangkari for Western Desert Aboriginal people is paramount to understanding the complexities of the spiritual, environmental, ideological, political, social, economic, mental and physical aspects of health. For thousands of years Ngangkari have been the sole providers of comprehensive health care for the wellbeing of Aboriginal people. The skills, wisdom, knowledge and history held by the Ngangkari in Central Australia will be explored along with the transfer of knowledge and skills down through the generations. Traditional medicines are produced and used from bush flora and fauna. Furthermore, Tjilirra, (ie, boomerangs and spears) are used in the daily practice of healing and treatment. Tjilirra (traditional tools) are used as a metaphor for transferring knowledge about life skills in group sessions. This way of working with young Aboriginal men in Central Australia reconnects them with the knowledge of elders and the cultural values, beliefs and skills in relation to mental health and social and emotional wellbeing. There has been a transition from the Ngangkari working independently in the past, to today where the practice is integrated into the dominant western model of health care, including mental health service delivery in Central Australia. This collaborative approach will be discussed where traditional healing and mainstream mental health care meet with reciprocal honour and respect of each otherâ€™s knowledge, skills and practices. This research is based upon an ethnographic study of shamans practicing in Perth, Western Australia. All of the women under investigation in this project work on a part-time basis with a view to working full time when they have built up their client base. This longing to devote their lives to healing practices is fraught with difficulties; although they are familiar with working in two dimensions, it seems they are caught between two worlds: the spiritual and the material. Without exception their primary income comes from a job main stream job and they work after hours as a healer, studying, developing and applying their unique healing techniques. Shamans work in the private space of their home, unable to openly admit to their shamanic healing powers or work in public, due to the possibility of compromising their primary source of income, the fear of social reprisals and other conflicting interests. I argue that new technologies are being used to transcend the boundaries of time and space to promote, locate and heal. The facelessness of â€˜Facebookâ€™ and other forms of social media is helping some of these women to promote their services, gather clients and allow them space to use their power, skills and ability to transform and heal other peopleâ€™s lives. I will demonstrate here how these women harness the power to transpose the spiritual and material.